Since Gomez won the Mercury Prize for 1998’s laid-back affair, Bring It On, they’ve continued expanding their sound and crossing into numerous genres with each successive release. 1999’s Liquid Skin introduced a heavier, more psychedelic side (“Devil Will Ride”), and 2002’s In Our Gun strongly featured experimental, layered electronic work (“Shot Shot”). Such sunny songs weren’t necessarily bad; in fact, they were highly enjoyable. They just weren’t as intriguing as the earlier work. The music in their latest release, Whatever’s On Your Mind, stays on a pop path that’s decorated with tinges of folk, blues, electronic, and whatever else they feel like throwing in. Traditional Gomez blends of the aforementioned genres create consistently compelling and entertaining textures. This blend is especially overt in intros, verses, bridges and outros. But sappy, clichéd choruses — which almost every song employs — feel detached from the verses’ more exotic moods and avenues. The opening track “Options” begins with beat-heavy, dark acoustic guitar alongside matching vocals and saxophones flourishes. But the chorus removes the verses’ intriguing sonic mixture; it launches into a pop sing-along melody of “Oh the things you’ll see, and the places you’ll go, and the people you’ll meet” that would fit well on Nickelodeon (okay, that’s an exaggeration, but you get the point). The bridge reintroduces the sax and inserts fellow singer Ben Ottewell’s highly distinct, deep and gruff voice alongside a roaring guitar and electronic sweeps. However, that deteriorates when the chorus returns. Even the outro is more appealing. Soaring violins (the one instrument Gomez has heretofore largely ignored) accompany Ottewell for the chorus on the title track, “Whatever’s On Your Mind,” which also features some cheesy lyrics (“Please hold onto your heart of gold / while you struggle against the cold / You keep dragging that heavy load / just let go”). But Ottewell’s powerful vocals don’t suit orchestral violins, which are too pristine when paired with his rough voice. His voice also can’t carry lyrics in the chorus for “Song in My Heart,” which simply repeats “You’re the song in my heart.” I mean, seriously? “You’re the song in my heart?” Even Rebecca Black’s “Friday” writer would be ashamed… maybe. The shallow lyrics are surprising considering Ottewell’s recent solo album, Shapes & Shadows, showcases a deeper lyrical prowess, as did Gomez’s earlier material. But here’s the thing: most of the music’s still great. Layers gradually build with precision, and the chosen instruments all fit well and combine to create alluring genre-bending and blending productions. When Gomez scales down the hyper-happiness, even just a bit, everything works so much better. Take the powerpop “Just As Lost As You” with its ripping guitar that echoes the sentiment of “I’m just as lost as you are / Does it make you feel any better?” The step down from contented declarations to insecure sentiments parallels the music’s edgier tones. Same with “I Will Take You There” with its uncommon structure and trippy instrumentation (an antique music box concludes the track) and “Equalize,” which opens like a Sleigh Bells-overdriven crunch-fest. This is where the band shines: more avant-garde pop-rock that doesn’t break down in the choruses. 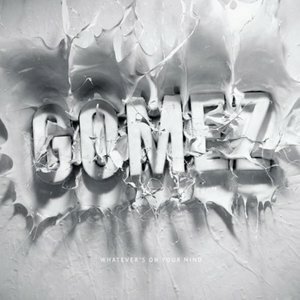 Much of Whatever’s On Your Mind’s captivating textures and bold sounds prove Gomez still has a bunch of interesting things to offer. In fact, the album would be excellent if the choruses and lyrics possessed as much charisma as the verses. But they don’t. And that’s a shame.